One hundred minutes of practically nonstop whop!-smack!-chop!-whack! action is an interesting, if risky, concept to hang a movie around. 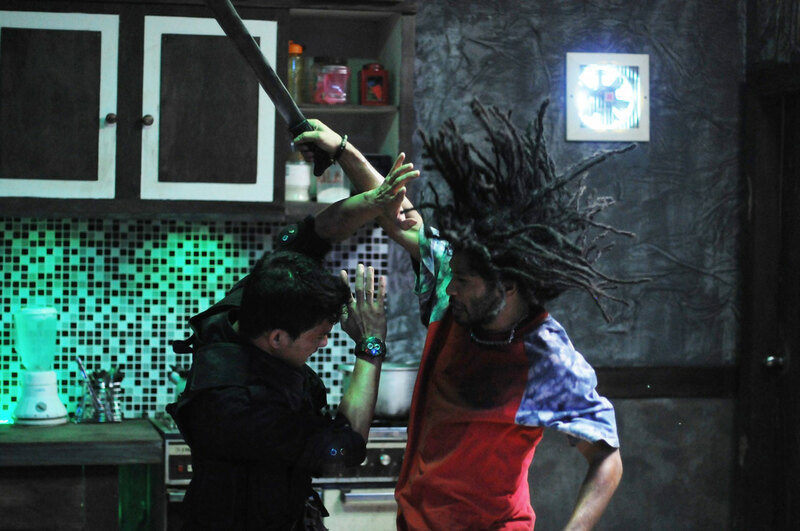 When the action is as well-done -- fast, furious, and relatively "believable" (as this sort of martial-arts-madness goes) -- as that found in THE RAID: REDEMPTION, fans of this genre had best get ready for a trip to heaven. For the rest of us, however, a few questions -- none of them deal-breakers -- may remain. A filmmaker new to me, Gareth Huw Evans (pictured at left), has written, edited and directed The Raid, so it is to him that all queries should certainly be directed. My first is "What's this 'Redemption' thing at the end of the title?" Was there an earlier Raid: Damnation or Raid: Retribution that we missed, to which this one's a sequel? I don't think so. 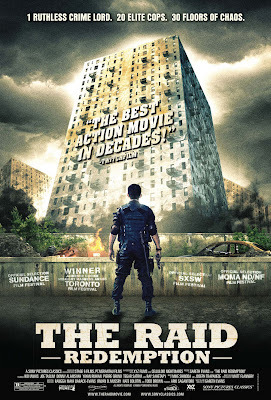 Then why not simply call your movie The Raid and leave it at that, since the plot -- simplicity itself -- entails nothing more than a raid upon a housing complex in which a notorious crime lord and his henchmen are holed up? Well, maybe this is all just a marketing ploy, as redemption is big these days -- even though it more often comes out like redumbtion. Evans' film also calls into question the meaning of the term "action movie." Is this a work, like the recent, tip-top French thriller Point Blank, which starts with a bang and then races around the city, hospital, corporate headquarters, police station and deserted warehouse as it develops its tightly-wound plot and very interesting characters into a fine piece of genre cinema that is certainly full of action? Or is it something like the relatively recent duo of District B-13 and its sequel, that, while highlighting the action art of parkour, also tackles racism, class-ism and the haves and have-nots with humor, irony and quite a bit of charm? Or maybe what is meant by an action film today is simply an extension of the Bruce Lee/Robert Clouse 1970s movie Enter the Dragon, in which, for its time, the newly discovered (in the west, at least) martial arts were given front-and-center, on-screen demonstration. The Raid comes closest to the last of the above three films, as the lion's share of its time is devoted to showing us the Indonesian martial art of Pencat Silat, as demonstrated by its stars Iko Uwais (shirtless, two photos above, and above, with firearm) and Joe Taslim, below with mouth agape -- and practically all of the rest of the film's huge cast, every last one of whom seem to know how to fight like crazy. 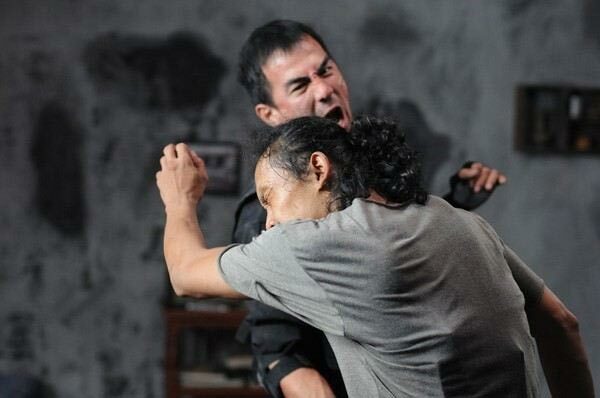 In terms of martial arts combat, The Raid may contain the best (it certainly contains the most) I've ever seen. I expect the camera has been sped-up somewhat, so that the rat-tat-tat of hands against hands (and other body parts) is near-constant, while the combination of these super-athletic, super-strong, super-agile performers and Evans' editing skills is often breath-taking. I suppose a martial arts expert might be able to find fault here, but I certainly could not. The film is tight (for awhile), frightening and bloody (the first victim is a mere child, even if he is part of the villain's operation), and when the fighting starts, it is fast, super-violent and -- sight and sound-wise -- full of shocking effects. One of the filmmaker's favorite is picking up a fellow by the legs, swinging him around and breaking his head againts a cement wall. You should have heard the sounds emanating from the excited male critics at the screening I attended. Zowie! The females seemed a tad less taken with the proceedings. However, at one hour and forty minutes, the movie is -- for any audience not terribly attuned to martial arts -- maybe 15 to 20 minutes too long. The plot, as I noted, is quite simple: Find the gang-leader and arrest him. And since the building he's in has maybe 16 floors (the ad says 30, but there are not), this will obviously take some time. Two surprises occur along the way, both of which have been telegraphed a bit strongly, and the final showdown fights last so very long that all but the most die-hard martial-arts fans will probably be wishing our heroes could grab a gun instead of their fists and end this thing fast. Don't get me wrong: I'm impressed with The Raid, so far as it goes. But for an action flick that includes more than (very, very good) fighting, I'll take the likes of Point Blank and the District B-13 duo. In Indonesian with English subtitles (don't worry: this is not a dialog-heavy film), the movie, from Sony Pictures Classics (yes, I'm shocked, too, but I guess, as we near the end of times, this storied distributor of art-house cinema must have decided to widen its scope and grab a larger audience) opens this Friday in New York, Los Angeles, Chicago, DC and San Francisco. Click here to see all currently scheduled playdates, cities and theaters. To answer your first question, it is added the word "Redemption" only for the U.S. release, because of the copyright issue (there's 1954 movie from Fox with the exact "The Raid" title). In other parts of the world it is simply called The Raid. Thanks, Zanirma. That's a fast answer, for which I am very grateful. I am surprised, however, because I understood that titles themselves could not be copyrighted. That's why certain titles have so many different movies representing them -- i.e., KIDNAPPED, with more than 30 movies, so far.